Our Vision is to build a church of 250+ by 2022 with an escalating learning system that appeals to youth and adults alike and inspires outreach to touch the community (military) and serves as a training center for future church leaders. Dr. Gary C. Patterson was born and raised in the State of Oklahoma. He entered the military at the age of seventeen and served twenty-three years working half his career as an Infantryman/Equal Opportunity-Race Relations Manager and the other half as a Chaplain. While on active duty he earned an Associates Degree (AA) in Psychology from the University of Maryland and a Baccalaureate (BS) from the American Technological University in the field of Social Services and Rehabilitation with an emphasis in Criminal Justice. Mid-way in his military career he departed the Army to enter Grace Theological Seminary in Warsaw, Indiana and earned both the Master of Divinity (M. Div.) and Master of Theology (Th. M.) degrees majoring in Systematic Theology. After this five years of schooling he returned to Army active duty and over the next ten years founded two chapel congregations and completed basic and advanced (two quarters each) training in Clinical Pastoral Education (ACPE). He served as a Chaplain Clinician at Brook Army Medical Center – Fort Sam Houston, Texas and the Methodist Healthcare System of San Antonio. Pastor Patterson received the Doctor of Divinity (D. Div.) from the American Theological Seminary and is presently in pursuit of the Master Certified Coach (MCC) Certification with the International Coaching Federation. Dr. Patterson is also the Founding and Sr. Pastor of the Berean Spiritual Development Complex and Church in San Antonio, Texas and a Regional Church Starting Director for 100 + churches of the Baptist General Convention of Texas. He is duly aligned with the National Baptist Convention, USA, the Baptist General Convention of Texas and the Southern Baptist Convention. 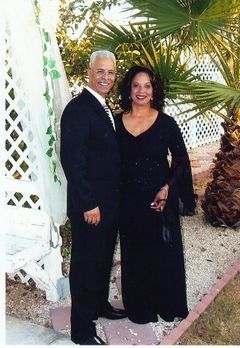 He is married to the former and beautiful Priscilla A. Taylor of Columbus, Georgia. - (800) 482-6224) and Certified with the International Coaching Federation (ICF) as an Professional Certified Coach (PCC). Level 3 Facilitator - Legacy Leadership® (7370 Hawk Road Flower Mound, TX 75022 USA (817) 497-4927) and Certified Facilitator of The Signature Program of the 7 Habits of Effective People (3480 Preston Ridge Rd., Suite 550 Alpharetta, GA 30005 USA (888) 576-1776). Priscilla Alfreda (Taylor) Patterson is the third of six children born to (James-deceased) and Mollie Taylor of Columbus, Georgia. Her elementary, junior and high school years were spent in Columbus graduating early to attend Florida A&M University studying Education with a secondary in Sports Medicine. Priscilla was commissioned as a 2nd Lieutenant with the honor of distinguished ROTC military cadet; she entered the U S Army as a Medical Service Corp Officer. The motivation for the pursuit of a medical military career was the fact that Army Military Medicine had been so instrumental in her fathers healing after suffering severe wounds in the Viet Nam War. She attended the Officer Basic Course and was assigned to Ford Ord California serving in the roles of platoon leader and personal officer. In 1988 she was assigned to Walter Reed Army Medical Center in Washington, D.C. to fulfill her dream to serve at the same healing establishment that enabled her father to walk into his home in front of his children after devastating war injuries. Priscilla served as Administration Officer, Operation/Logistical Support Officer and Teaching/Training Officer. To climax her military career she served as Company Commander of the Headquarters Company of the Army’s Flagship Military Hospital Walter Reed Army Medical Center in Washington. Priscilla then decided that she had completed her dream as a military officer at Walter Reed she transferred to Fort Sam Houston to join her fiancé the Chaplain (CPT) Gary Patterson. The two married on 14 August 1993 working together to give birth to the Gospel Care Center Chapel Service on Fort Sam Houston, which continues to this day. At the end of her military career Priscilla has worked in the telecommunications industry with positions in Project Management, Management, Commission/Budget Analyst and Team Supervisor and at present serves as a Compensation Analyst with Verizon Telecommunications. 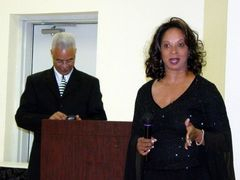 Priscilla’s spiritual service to the Lord began at an early age as a member of Pine Hearst Community Baptist Church in Columbus Georgia. She later recommitted her life to the Lord at the Gospel Care Center and presently serves along side her husband as a founding member of the Berean Bible Fellowship Church. Priscilla is a committed Pastor’s wife, diligent disciple maker, involved women’s auxiliary worker, valued first lady, and most of all a true servant of our Lord Jesus Christ.